I went for the walk at anew Forest today and decided to stop for a walk in the forest so we stopped at Puttles Bridge parking.At that moment when we stopped there was no other car parked .We left in the car my husband Rucsac (left on the front seat) and at the back of the driver seat my car .We came back to the car after 40min walk to see out back car screen smashed in pieces and my bag stolen .We are not from the area but we are coming to new forest for the walk every time we have some free time and we do enjoy it but from today I don’t think we will ever come after such an ugly experience .I know that it was silly to leave my bag in the car but who will thing in such a civilised country there are horrible people who would damage your car and still your personal belongings ....Anyway lesson to be learn.So my bag is a brand new Joules bag (brown on the sides and pink tweed on front and back) inside my red walled with different bank cards and my Romanian ID,2 pair of Ray ban sun glasses one brown case and one black case,a Romanian passport under my friend name(under personal circumstances I was carrying in the bag) ,my house keys plus my husband car keys(the only set we have got) plus few other bits and bobs like a small make up purse ,tissues,shopping bag,my working team pass.We are both gutted so if anyone please find anything like this I will leave my phone number and every little help will be much appreciated.I had no cash in the bag so I am hoping whoever took my bag will drop it somewhere in the area. I'm really sorry to hear of your experience during a visit to Puttle's Bridge. 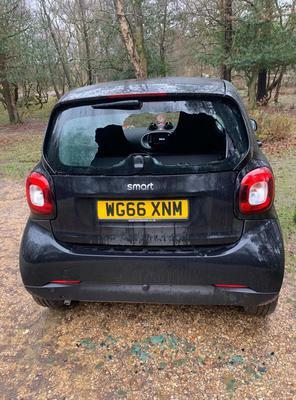 Sadly, thieves are all over our beautiful country and they are opportunists who will take the risk of smashing a car window to gain worthwhile items to steal. I will post this on the main part of this page as well but with a contact me link rather than your phone number (publishing email or phone numbers is against the T&C's of my website) I hope you gain all your possessions back and am really sorry this happened to you on your visit to us.